Click on the photo below to view Thursday Inground Pool photos. Or, click [ Photos ] to view on Gallery page. New for 2020, Sunken living room, spa, firepit, sundeck, putting green (patent pending). Proprietary non abrasive, non skid surface on all benches and sundeck. Exclusive Owens Corning Fiberglass. The only fiberglass made in the USA. Innovations like the Lucky 7 skimmer. All fiberglass pool walls are tilted. The Lucky 7 skimmer makes the top of the skimmer level. Growing from a 25,000 square foot facility they have doubled to a 60,000 square foot facility. Exclusive features like a backfill eliminator. It gives you full support under the sun ledges and ease to access the plumbing. A “green” Thursday pool that is ISO 1400I certified and reducing impact on the environment. 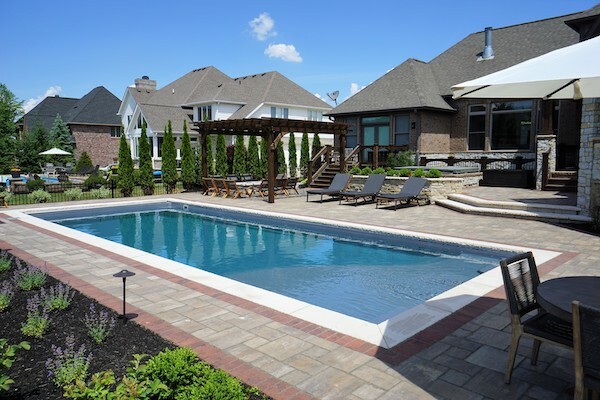 As the industry’s only ISO 9001 certified fiberglass pool manufacturer Thursday Pools set the standard in fiberglass pool construction. A true 360 degrees of support built into all high stress areas of the pool. An optional ground anchor system. Best pool finish in the market. Thursday Pools are built by Science and not Marketing. Learn more about Thursday Pools. Thursday Pools is dedicated to bringing cutting-edge innovations to the pool world. Thursday Pools designs and manufactures fiberglass pool shells that are hand-crafted with the highest standards and craftsmanship. Our one-piece, inground fiberglass swimming pool manufacturing facility is based out of Fortville, Indiana.